From the director of the silent epic Napoleon, and acclaimed as one of cinema’s finest anti-war movies, Abel Gance’s rousing indictment of warfare is as powerful and relevant today as it was on its original release in 1938. Previously unreleased in the UK, J’accuse comes to DVD and Blu-ray, presented in a Dual Format Edition and released by the BFI on 24 July 2017. Special features include a new full-length audio commentary by leading Gance expert Paul Cuff. Having experienced the horrors of the First World War, idealistic inventor Jean Diaz (Victor Francen, A Farewell to Arms) hopes to harness technological innovation in his bid to prevent further barbarity. But a meddling and unscrupulous bureaucracy allows Jean’s plans to be hijacked as Europe slides towards another great conflict. Using his epic 1919 silent version of the film as a template, Gance pits mankind’s romanticism against its capacity for savagery. 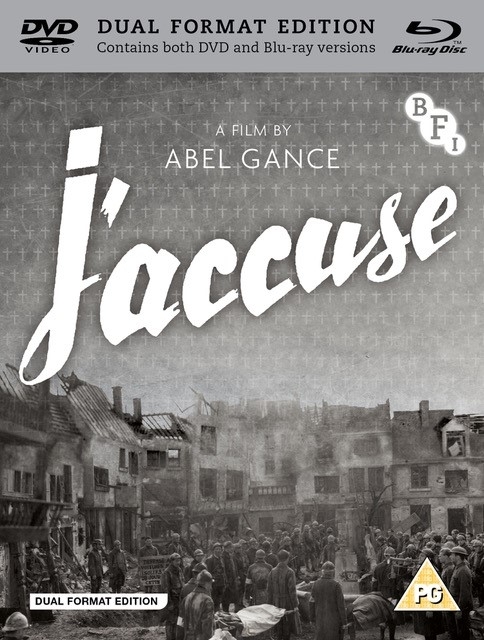 Originally released on the eve of the Second World War (and the same year as Jean Renoir's La Grande Illusion), J’accuse urges us to honour the memory of the fallen by learning the lessons of a catastrophic past.